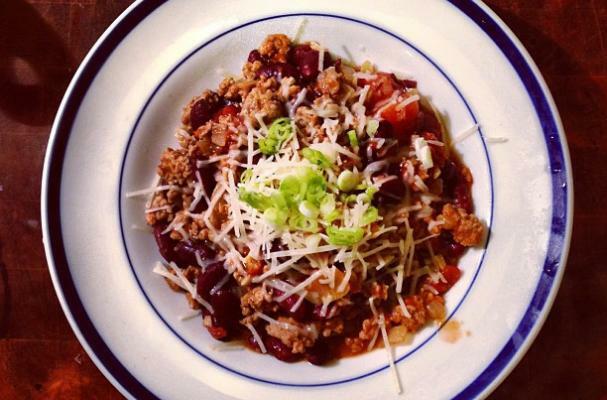 Slow cooker turkey chili is a dish that cooks itself. After you saute the ground turkey with onions and garlic, all the ingredients and placed into a crock pot and left to get to know each other. The flavor is coaxed out of each ingredient until they form one happy medley. This chili is delicious on its own but goes well on top of a burger or hot dog. Don't forget to serve it with plenty of shredded cheddar, diced onion, and pickled jalapenos. Start out by cooking up your turkey, onion, and garlic in a pan on medium heat. While your meat is cooking up, grab your slow cooker and add in the roasted peppers, diced tomatoes, broth, beans, pepper, corn, molasses, worcestershire, brown sugar, beer, chili pepper, cumin, oregano, and apple cider vinegar. Now add in your cooked up meat and mix it all together. Cook it on high for 3 hours or on low for 4 to 6 hours. Salt and pepper it to taste before serving.